The power industry was one of the first to employ large-scale computing in its design and operation. The available tools have primarily focused on large-scale power system stability analysis or protective relaying application. Kestrel has developed software applications focusing on generator control and testing based on decades of experience. Our tools are constantly being enhanced to reflect changing regulations, vendor equipment, testing methods, and modeling/model verification techniques. Our tools are benchmark tested against industry standards and simulation platforms, but are designed to allow for the diverse and changing needs of our customers. 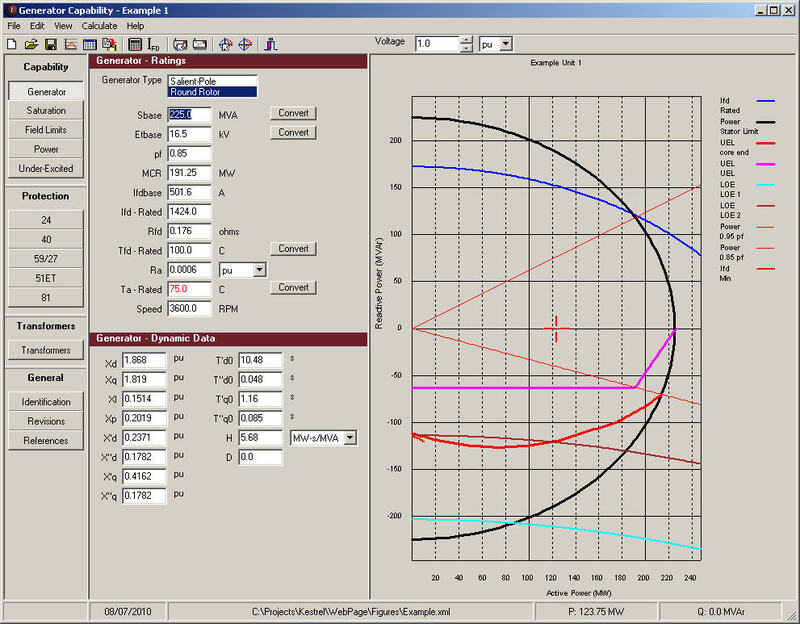 The generator capability program (GenCap) has been designed to calculate and visualize capability limits and relay/limiter coordination on utility-scale synchronous generators. The curves generated by this program can be used to demonstrate coordination of excitation limiters and protective relays with generator capability in order to comply with the latest NERC PRC-019 and PRC-024 requirements. Generator capability curves are x-y plots of active and reactive power or R-X impedance operating points. The individual curves that make up the capability curve normally represent different physical limitations of the generator (e.g. continuous stator current limit, continuous field winding current limit). 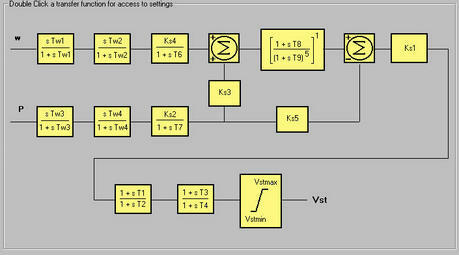 Families of curves can be plotted for different generator terminal voltage conditions. Generator parameters and limitations are entered on separate forms an example of which is shown below. The resulting capability curve can be viewed within the application or saved in a variety of formats for inclusion in reports or other documentation. In addition to the standard generator capability view, GenCap supports entry and plotting of protective relay settings and standards for demonstration of compliance with the latest regulatory requirements. 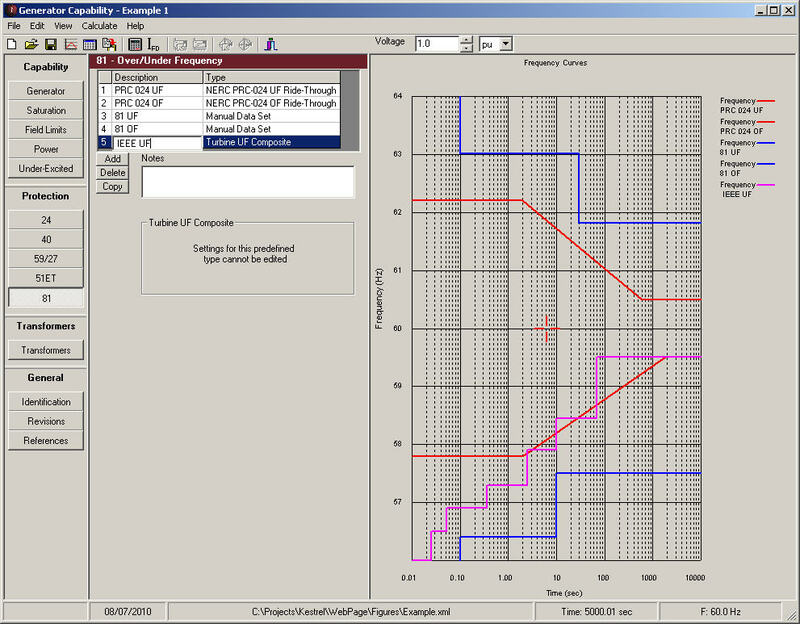 An example of the under/over frequency coordination view is displayed in the following figure. 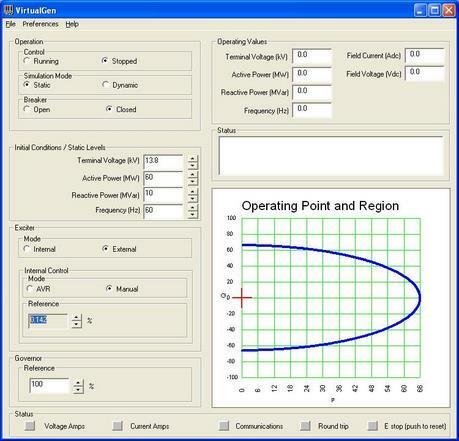 Virtual GS is a simulation environment intended to reproduce the control dynamics of a utility-scale generator and developed specifically by Kestrel as a training tool. Several different operating modes have been reproduced (e.g. grid interconnected, off-line, electrical island) to illustrate the performance of the units and their controls. A Virtual GS license is included in all Kestrel Power training sessions. Operators - focuses on the effect of different controls on the operation of the units and makes use of familiar controls and meters. Electrical - provides an in-depth simulation of the control equipment and uses an interface that includes chart recorders and test signal inputs that would be familiar to an Electrical technologist or engineer. Mechanical - focuses on the operation of units as affected by governor control with familiar controls and meters. Relay test sets and dedicated three-phase ac voltage and current sources have long been employed in the static testing of excitation systems and other generator controls. While these systems allow verification of the static setpoints of regulators and limiters they did not provide any method of testing the complex dynamics of these devices. At the same time a number of systems have been designed to allow detailed generator and power system transmission simulations to be coupled to physical devices such as relays for "hardware-in-the-loop" tests. These special-purpose systems have been relatively expensive and were not portable thereby preventing in-situ testing of larger equipment. NERC regulatory requirements call for periodic re-verification of the settings and performance of many of the excitation systems controls. Many Utilities are seeking methods to reduce the duration of tests and the risks associated with testing of excitation limiters at the operating limits of their equipment. The VirtualGen simulator was designed to provide a realistic simulation of generator dynamics under a variety of operating conditions for inclusion in "hardware-in-the-loop" testing. VirtualGen software utilizes a high speed connection to a standard relay test set in order to respond to stimuli from the system being tested in real-time. VirtualGen simulates the dynamics of the generator and power system in real-time and can be adjusted to represent any generator and system connection strength. The system can also be used to perform acceptance tests of new equipment prior to their application in the actual station environment.